record number of attendees. The event kicked off with a full slate of meetings and educational sessions, receptions and the much- anticipated appearance by Jay Leno. Nobody was disappointed! The overall tone and atmosphere of the entire week was relaxed, while staying business-like and quite upbeat, more so than it’s been for the last few years. This year saw 3,629 attendees and 268 exhibitors take advantage of the well-rounded program offered by WQA. Wishing Well International Foundation again hosted the annual charity golf tournament, sponsored by HaloSource, Inc., at The Revere Golf Club in Henderson, NV. This very successful event guaranteed fun, prizes and bragging rights for all who took part. Tournament winners were: 1st place, Brian Good’s team (Good, Bill Hanson, Pat Dalee, Rob Anderson); 2nd place, Kurt Peterson’s team (Peterson, Brent Simmons, Mike Conte, James Good) and 3rd place, Shawn Talley’s team (Talley, Dave Milner, Doug Haring, Mike Vondran). The Closest-To-The-Pin Award went to Buzz Goldstein of Charger Water while Brian Good won the Longest Drive Award and the Longest Drive Dixon Competition, which earned him a driver. Longest Putt honors went to Issa Al-Kharusy of KDF Fluid Treatment, with a putt just short of 25 feet. The annual President’s Club Reception was hosted by Mr. and Mrs. Douglas ‘Sam’ Karge, who feted attendees with style and gusto, while honoring the lifetime members of the President’s Club, 2014/2015 award winners and Board of Directors. The lively crowd was on hand to congratulate Margaret Wichmann as she received the Bill Peltier Award as the #1 Recruiter and to honor the efforts of the all-female top recruiting team with the Team Award. Members included Denise Heskett-Al-Kharusy, Shanna Bucki, Kate Cline, Daina Grace, Jo Grace, Cindy Gresham, Susan Kernan, Nicole Reisdorfer, Barbara Wakem and Margaret Wichmann. NSF International hosted a special reception, this year built around the Willy Wonka chocolate theme. It was great fun, a chocoholic’s dream come true, filled with special treats and prizes. Holders of the Golden Ticket chocolate bars received the Beats music system, although the chocolate fountain, ice cream and candies were just as much appreciated. 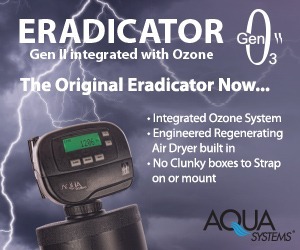 The key to success in the water treatment industry is having the right products for the varied treatment issues. At the forefront of seeing that happen is the Water Quality Research Foundation, responsible for directing funds for those projects that are most relevant. The Water Science Committee reports on current and prospective studies that are being considered. Regu Regunathan says an RFP is needed to investigate chloramine usage in commercial applications, as taste, odor and biofilm problems are ongoing. Although structurally different approaches are being used, work on the IAPMO Z601 standard is progressing. 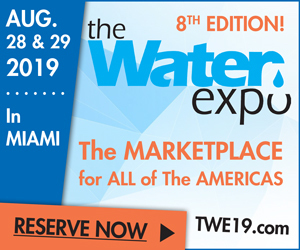 A project with NGWA (under which WQA is subcontracted) for reaching private well owners to encourage testing will include a survey to analyze current programs to determine the best and safest approaches for promotion; WQA will develop a model program for dealers. another project. The committee reported on the current states of several ongoing projects. The Madison (WI) Chloride Discharge Study has been completed and has given insight to optimization but some remaining questions were still being processed. The IAPMO Peak Demand, Final Bar- rier Cost-Benefit Analysis and Boil Water Advisory studies have progressed, with data still to be acquired and ana- lyzed over the next few months. Final-barrier analysis has been revamped with Dr. Kelly A. Reynolds, MSPH, PhD, University of Arizona, spearheading the project. Multiple sessions on greywater usage, requirements, limi- tations and regulations were held. At this point in time, it was noted that no single, universal regulation is in effect. Dealers were advised to treat water only to the level for which it will be used and engage educationally about how to catch, treat, store and distribute the end product. Iron contamination, ubiquitous throughout the US, was addressed by Scott Harmon, Matthew Wirth, Marcy Stenerson, Larry Zinser and Kelly Parks. The panel discussed the relative similarities and differences by region, treatment methodologies and best practices. John Keener, Toledo Water Conditioning hosted Aquageddon, a discussion of the recent water disaster in the Toledo, OH water supply. He noted that microcystin-LR is four times more toxic than cobra venom; toxic levels were 30 ppb and there are 80 different cyanotoxins but little information is available. 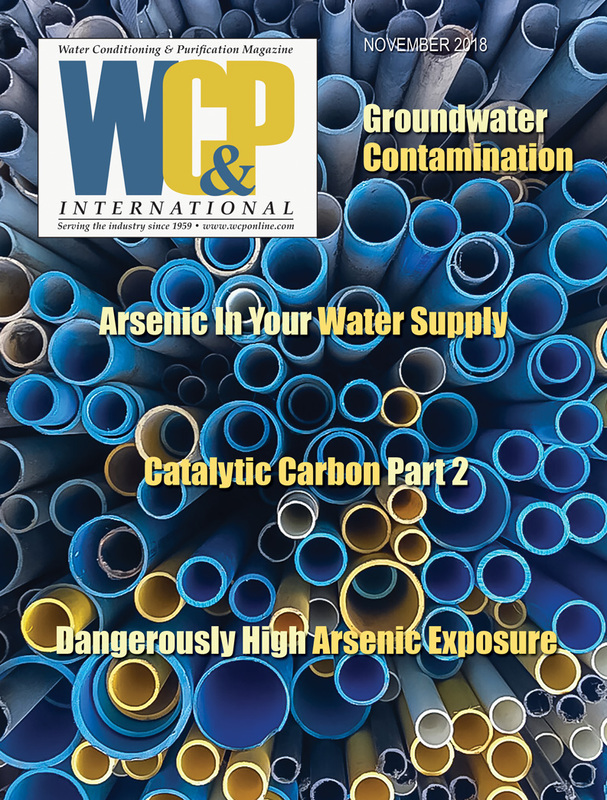 There were a variety of contributing factors, not the least of which was phosphate contamination from fertilizer use (phosphates feed microcystin). At the forefront of much thinking was sustainability and conservation. Douglas Oberhamer presented Arizona Water Quality Association’s best practices, including water conservation, reuse and salinity management. He noted that working hand-in-hand with the state had resulted in a well-rounded program that did not include water softener bans. Arizona has spent a great deal on a public awareness campaign, and while there is no specific task force, work is ongoing with state officials. In addition, David Martin conducted interviews with 3M’s Mark Howlett and Felipe Pinto of Dow Water & Process Solutions. Martin will give a full accounting of these interviews in his July Creative Marketing column, as well as reporting on WQA’s National Consumer Water Quality Study and other marketing highlights. The session opened with comments from President Sam Karge noting that 2015 was the biggest show in several years and although progress is consistently being made due to a better economy and more jobs, slow sales and bad weather in the northeast did hamper some areas. The organization, he said, is in good financial condition with $8.7 million in reserves and is proceeding with its core mission. The Modular Education Program (MEP) has been fully launched with new title designations (CWS-1 through 4 to Certified Water Specialist; CWS-5 and 6 to Master Water Specialist) effective April 30. Board member elections included Cindy Gresham, Kurt Gruett, Doug Horner and Shannon Murphy in the manufacturer category; William Jefferis, commercial/ industrial and Tom Harrington, Kelly Parks and Bret Tangley in the dealer category. John Packard gave a heartfelt thank you for the overwhelming success of the Investing in Your Future Campaign, which has garnered $2.7 million through 80-plus partners, with more to come as donations continued to be offered and tallied. WQA Vice President Tangley announced the following leadership awards: Ray Cross Awards posthumously presented for Donald E. Heskett and James A. Horner to their children, Denise Hesket- Al-Kharusy and Doug Horner, respectively; Golden Circle, C. R. Hall; Honorary Membership, Ryan Harper; Award of Merit (International), Rajul Parikh; Award of Merit, Wayne Bernahl and Mike Mormino; Regents Award, Ed Robakowski; Key Award, Cliff Fasnacht; Lifetime Membership, W. Gordon Miller and Hall of Fame Award, Denise Urbans. Following the business segment, a packed house greeted keynote speaker Leno, who delivered a one-two punch of hilarity appreciated by all. It was an event to remember and will be difficult to top in coming years! During a combined meeting and education- al session, Kelly Parks, Robert ‘Bob’ Boerner and Kelly Johnson highlighted the more important points of becoming and remaining a successful water treatment dealer. Parks encouraged all dealers to focus on customer service, not the bottom line. He said that staying in contact with customers, even when there are no problems, es- tablishes a stronger bond and enhances referrals. Parks emphasized that personalizing service through constant contact (at least once a year) was a win for both dealer and cus- tomers. In addition, he advised that listening to the customer and offering some type of resolution will help turn a negative into a positive. “Admit when you are wrong. Move forward.” Parks said that owners should handle complaints but if that is not feasible, recommended hiring someone dedicated to handling them. Boerner tackled personnel issues, saying: “Don’t hire too quickly! Get background checks, have multiple interviews, use temporary agencies if necessary.” He also gave advice on business security, saying that owners need to maintain accountability, lock up valuable inventory and always check accounting procedures. In addition, Boerner said it’s important to work in and on the business but especially to watch the bigger picture. Johnson noted that while the insurance industry doesn’t like the water industry, it’s a necessary requirement. He emphasized the need to reduce claims and losses, be careful with equipment placement, have well-trained staff, take pictures of installations and equipment and have an internal insurance claims process. In addition, Johnson advised that employees should be very careful of what they say. Tanya Lubner, PhD, WQA Director of Training and Education, implored owners to push employees to succeed with the MEP by establishing realistic goals, encouraging on-the-job ac- tivities and mentoring. She noted that changes to the certification structure would be grandfathered for current certified special- ists. There will be no change to the Installer and Sales Rep titles and levels. Interim Executive Director David Westman gave an industry update, focused on governance, staff, strategic planning, operations and government affairs. He noted that about 14,000 products have been certified, according to a recent operational audit and a new financial auditing firm has been retained. Matthew Mahany, Kenny Gibson and Robert ‘Bob’ Ruhstorfer presented two educational segments: rentals versus sales and salt delivery versus maintenance programs. The panel members noted that rent-to-own is an attractive option for many consumers, saying that if you can sell it, you can rent it. In addition, there was consensus that these shouldn’t be viewed as exclusive programs and both should be considered viable opportunities. Knowing one’s audience, offering tiered programs and selling employees first were presented as basics that should be incorporated into the business plan. Approval was received from the Texas Commission on Environmental Quality to accept 17.5 hours of specific WQA training under the agency’s regulatory guidance document, RG- 373: Approval of Training for Occupational Licensing. Attendees were required to submit fully completed attendance forms to TWQA by May 15 to receive proper credit toward state licensing. Outgoing President Sam Karge took care of last minute busi- ness, then officially handed the reigns over to incoming President Bret Tangley. Karge said progress had been consistent and terrific momentum had been built. Tangley said the organization needed to be more strategic than operational, with a more energized board. He will encourage more participation between the Direc- tors and Governors and make WQA more customer-facing with better communication, saying: “We’re gonna have some fun!” John Packard reiterated the extremely successful WQRF funding campaign results and noted the exceptional support from Kim Redden and Peggy Blazek. WQA statistics remain impressive: 2,657 member companies (83 percent of which are domestic) with an 88-percent retention rate; 1,714 professional certifications have been granted and 1,359 new products (as of 2014) have been certified. Committee reports indicated that WQA will expand consumer awareness; the Regulatory Info Search Tool is now ready and professional development is beginning to take off with 166 companies and 566 users (students, mentors and admin) taking part in MEP. 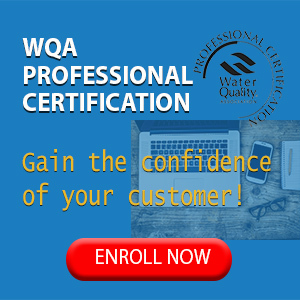 In the industrial realm, the focus will be shifted from high-purity water to serving WQA membership in support of those who are engaged in this market segment. Committees will next meet at the WQA Mid-year Leadership Conference, which will be held in Tucson, AZ August 31–Septem- ber 2. And it’s time to start planning for WQA’s 2016 Convention in Nashville, TN, March 14-17. We’ll see you in September, and if not, let’s make it a date for 2016! Photos courtesy of WC&P International staff, with the exception of those otherwise credited.